“Little Forest” is a film with a bit of pedigree. The original source is a 2002 Japanese manga of the same title, written and illustrated by Daisuke Igarashi and subsequently adapted in a two-part live action movie in 2014. Now it has been picked up and readjusted by director Yim Soon-rye, one of the most important Korean female filmmakers and a leading figure of Korean New Wave Cinema. “Little Forest” was released by Megabox at the end of February and earned $5 million only in the first five days. It is part of Udine Far East Film Festival’s line-up as a European Premier. The film is the simple story of a very hungry young woman. She is hungry for tasty real food, for soul food and for answers she cannot find and therefore she will eat her way to happiness. Hye Won (Kim Tae-ri) is that young woman; she grows up with her widowed mum (played by the great Moon So-ri) in her dad’s rural village. Her roots are there but once she becomes a young adult she moves to Seoul to work and study. Her departure from the childhood village is triggered – if not forced – also by her mum’s abrupt decision to leave and find out what life had taken from her in all the difficult years as a widow and a single mother. But life in the Big City hasn’t really gone according to plan for Hye Won; exams, work, boyfriend … everything is crumbling around her, and there is something she needs to figure out before anything else and in one snowy winter day, on the spur of the moment, she returns to the empty childhood house where she grew up. “Only for few days” she keeps saying, but we know already it is not what will happen. In the hometown, she reunites with her two childhood friends, both carrying a heavy baggage of dreams, struggles and hopes. Jae Ha (Ryoo Joon-yeol) is the one who never left the village and works as a bank clerk, hating it and dreaming of escaping, while Eun Sook (Jin Ki-joo), after a spell of life and work in the city, has made up his mind and decided to build his future as a farmer in the village. They represent two faces and two opposite reactions to the same rural upbringing and Hye Won sits somewhere in between. She loves cooking – something her mum was very good at – and she slowly builds up her self-sufficient uncomplicated life with a sweet dog called Fivo, the farming, the cooking and the eating. Those basic and somehow ancestral, season-regulated routines and the surrounding lush nature will help her set her life back on track. The main merits of this little gem of a movie are its light touch and measured tone. In times where food, cooking and eating are everywhere, “over-metaphorised”, blown up out of proportion and very often used as an easy way through audiences’ hearts, it was a real surprise to see how careful and restrained the director and scriptwriter’s take was, especially on a source material which is heavily based on recipes (the manga has a precise recipe for every chapter). The subtractive work really pays off here; the meal preparation is incorporated in a completely organic and unfussy way, keeping just its role of nourishment and maternal bond. The characters are outlined well enough for us to care about them, while the story lines are left suspended in mid air. There is a suggestion of romantic interest, there is a hint of mother-daughter conflict, some clues of Hye Won’s life in Seoul but in reality it’s doesn’t matter, the focus of interest stays firmly on Hye Wo’s dialogue with nature and farming seasons, her very own little forest. In the same moderate way, the movie – refreshingly – doesn’t preach or push any ideal of a bucolic nirvana. It is a very gentle experience that concentrates on Hye Wo’s sabbatical escape from the confusion of her mind, her slow reassessment of priorities and needs, and her appetite. The gorgeous cinematography by Lee Seung-hoon is – as expected – an important part of this slow observation of the soothing power of simple natural life and it never lets down. Together with Lee Yun-oh’s playful score, they create a “levitas” and a whimsical quality that lightens the mood while the sound design enhances the food characteristics (especially the “crunch” factor) in a way that will have you salivate. Performances are good all around but Kim Tae-ri really shines in this role, her acting being complemented by her incredible, unsophisticated beauty. Moon So-ri has a small but poignant part as the mum in Hye Wo’s memories. 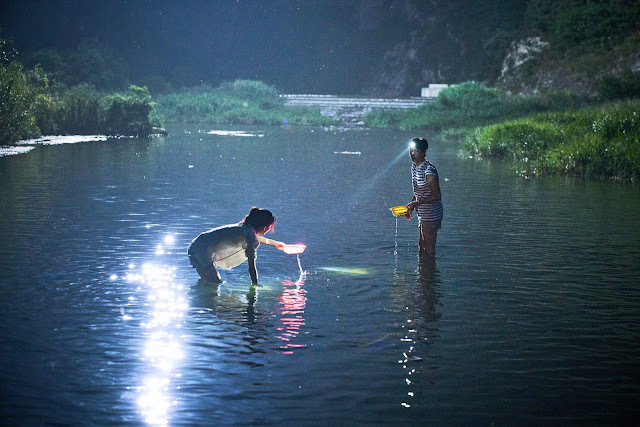 In a fashion that is quite unusual in contemporary South Korean cinema “Little Forest” manages to steer clear of excessive romanticism and soppy melodrama. Moreover – incredibly – it does all these wonders in a good-old-fashion running time of only 1 hour and 40 minutes. One of FEFF’s pleasant surprises.